Francis Lam has written an interesting piece on the history of General Tso’s chicken for Salon.com. And I think it may clear up one of the niggling little questions that has been perplexing me since I gave a paper on the subject last month, at the School of Oriental and African Studies in London. In the discussion that followed my talk, I realised that I didn’t have any idea how to explain the fact that, although the Taiwan-Hunanese chef Peng Chang-Kuei seems clearly to be the originator of the dish, and although the Chinese name of the dish on the menu of his restaurant in Taipei is Zuo Zongtang’s chicken (左宗棠土雞 － Zuo Zongtang is the full name of General Tso), he translates it as ‘Chicken a la Viceroy’. It didn’t occur to me to ask when and how the English name was changed from ‘Chicken a la Viceroy’ to ‘General Tso’s Chicken’ – and I’d resolved to ask Chef Peng and his son about this detail next time I talk to them. Anyway, Francis’ article does suggest an explanation, which is that two other chefs in New York, David Keh and T.T.Wang, who had trained in Chef Peng’s Taipei restaurant and adopted many of his recipes, started calling the dish ‘General Tso’s chicken’, two years BEFORE Chef Peng opened his own restaurant in New York. Did Chef Peng adopt their translation for his own NYC menu? Does this make sense, Francis, Ed Schoenfeld, Jennifer 8. Lee, my fellow General Tso sleuths? Not sure i can add anything to the General Tso discussion but i believe David Keh,who you mention, opened the first sichuan restaurant in New York. The restaurant Szechuan Taste opened around 1969 and was located at Chatham Square in Chinatown. To my memory the most interesting dish on the menu was called Tai Chi Chicken , a dish which is now ubiquitous on menus in chinese restaurants in the states. The dish is quite spicy, indeed the recipe given to me called for an ounce of chili peppers but the version you most often see today is deep fried and sweet. The original Tai Chi chicken was a saute of chicken pieces( on the bone as i recall), pepper and mushrooms with a sauce based from the mushroom soaking liquid. As with General Tso’s chicken we seem to have a habit of moving to deep frying from sauteing and adding sweetness to the dish. The same process doesn’t seem to happen with French cooking. When i get a bad beef bourguignonne the meat is typically dry and the sauce is either non-existent or tasteless but not sweet. Taiwanese SATEE more than Schichuan – especially since I have had many discussions,not with chef’s, but the people contrasting the Taiwan migrated flavors versus original Shichuan. There are some interesting discussions in London, Ontario and Toronto with my friends on the the cross regional cultural styles. But what do I know, I have only been living with my family from Nanjing and Shanghai for 15 tears . . . I became friendly with David Keh in 1969 when he opened his second Sichuan restaurant at the SE corner of of W 95th St & Broadway. It was simply named ‘Sichuan’. The first NYC Sichuan restaurant was indeed called Sichuan Taste,and was located in Chiantown on a corner of Chatham Square. 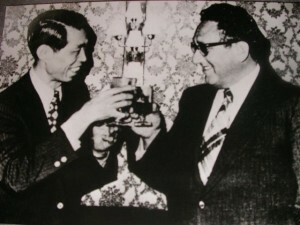 It was owned by Mr Keh and his partner Robert Chow (Chao?). I subsequently became David’s assistant (in 1972) and spent 4-5 months working on the pre-opening of what was to become Uncle Tai’s Hunan Yuan. I was then employed as a host and captain there: from Jan ’73 – July’75. In the early 70’s both Mr Keh and Chef TT Wang, the owner of the 4 star-rated Shun Lee Dynasty and the Shun Lee Palace went to Taipei looking for a new idea to bring back and they both discovered Chef Peng and his Hunan-style banquet cuisine. Neither of these individuals worked for Chef Peng, but they both sought out individuals who had and who knew his repertoire. Coincidentally and independently of one another each entrepreneur returned to NYC and each opened a Peng-style Hunanese restaurant within months of one another. Each restaurant received a 4 star NY Times review. Chef Wang’s Hunam opened at the end of ’72 while Keh’s Uncle Tai’s openind in Jan ’73. About 18 months later Chef Peng himself showed up and opened Uncle Peng’s Hunan Yuan. To New Yorkers it seemed like the imitation rather than the original. I was there the day Cbef Peng showed up and cooked his first NYC banquet. It was excellent, but so was the cooking of Chef Wang and Chef Tai. It is quite clear in my mind that it was TT Wang who crisped and sweetened the formerly spicy tart dish that we today call General Tso’s chicken. And it his version that has really become the popular classic that is ubiquitous. As far as Ta-Chien Chicken goes that is another story all together. It is named after the 20th Century master artist Chang, Ta-Chien. It was invented by his family chef, Lou Huey Yen. Chef Lou (or Uncle Lou as he was known)was a fabulous Sichuan-style banquet chef who lived in exile with his patron, the artist Ta-Chien, in Sao Paulo Brazil. He finally showed up in NYC after the immigration laws changed here: the year was 1966 and he worked at a long forgotten ‘authentic’ restaurant called The Four Seas that was located in the Financial District. He subsequently was the chef at Sichuan Taste and then the chef at a restaurant called Sichuan East on 2nd Ave & 80th St.
Ta-chien Chicken as prepared by Chef Lou was (and is) chuncks of chicken on the bone braised with top quality rehydrated shitake mushrooms, winter bamboo shoots and scortched dried chilies. The cooking liquid is a mix of mushroom soaking liquid, chicken stock, rice wine, soy, a touch of sugar, ginger, scallion,and the dish is covered and wok-braised for 5-6 minutes. The sauce is then reduced, thickened, and finished with a touch of sesame oil. Uncle Lou was my cooking teacher and he made this dish often. thanks Ed, very interesting hearing about the history of chinese restaurants in that late 60’s, early 70’s time period. Your list of ingredients in Ta Chien Chicken is much more detailed than the brief list given to me at the then Szechuan Taste. Perhaps we can take this offline ( my e-mail is mel.winokur@gmail.com )but i’d like to know if to your knowledge there is any restaurant in the NY/NJ area doing Ta-Chien chicken approximately along the original version. Fuchsia-have you seen a version of Ta-chien chicken in China? Consider adding to one of your books? No, I’ve never come across Ta-Chien chicken in China! So I’ve seen no reason so far to include it in one of my books! My local sichuan restaurant in leeds, Red Chilli, serves a dish caled Painter Daquian Spring Chicken which seems across between a sweet General Tso’s Chicken and a Hot and numbing Gong Bao chicken. Is this dish unique to this restaurant, or more widely known in China and beyond? As I have not seen it elsewhwere. Matt – See Ed Schoenfeld’s comment above about Ta-Chien chicken, It’s just a variant transliteration of the same Chinese characters as Daqian. Hope that helps! We’re heading to Taiwan to visit my in-laws in May and I’ll try to make it to Peng’s restaurant and ask him about the odd “Chicken a la Viceroy” translation. Would it be appropriate to publish the name, address and phone # of Chef Peng’s restaurant here? The person you need to talk to is Peng Chang-kuei’s son, Chuck Peng, who now runs the business. Please let us all know what you discover! By the way, I use sweet rice flour instead of wheat, cornstarch, potato starch or flour, or tapioca flour or starch, and it seems to work better than anything I have tried so far, though a pinch of arrowroot added was even better, and a small amount of cream of tarter and sodium bicarbonate just added to the crispiness…and one egg…or egg white…to about 4 large thighs worth of meat…cleaned/de-boned….but I go ahead and fry the skin..have a nibble…give to the neighbors dog that visits when cooking outside…smoke and all……and really hot oil…coconut is great!